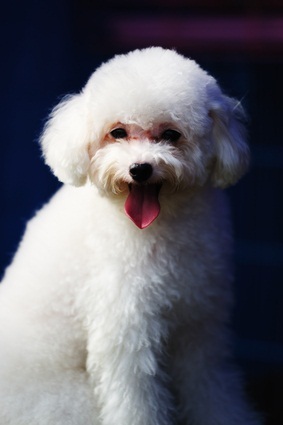 No pet owner wants to think about poodle health issues, but your poodle will get sick occasionally. He will run into things, get bit by bugs, step on something sharp and get cuts, scrapes and bruises. For cuts, treat him like you would yourself. Clean the area with soap and water and put some antibiotic ointment on. If redness, swelling and soreness ensue, it could mean an infection. Call your vet. Puncture wounds should be cleaned with hydrogen peroxide. A small amount of antibiotic cream may be applied. If redness or swelling ensue, it could be infected. Call your vet. 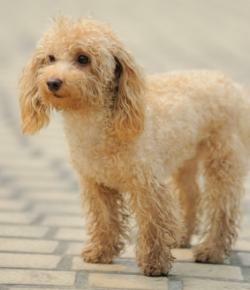 Just like us, poodle breeds can get food allergies and allergies to pollen and mold. If she has excessive itching, scratching, licking or biting, it could be an allergy. Call your vet. If you can't get in contact with your vet or feel that it's not an emergency, you can also get your poodle dog health care questions answered online by a veterinarian 24 hours a day, 7 days a week. Food allergy and food intolerance symptoms include gas, loose bowels and tummy pain. To test for food intolerances, stop what you are feeding to her. At the next meal, give her one thing that she hasn't eaten before, some protein source. Feed this to her for 30 days. If the symptoms disappear, she probably has food allergies. After 30 days, add another ingredient to the diet and keep her on these foods for 30 days. Continue adding one ingredient each month to see how your dog reacts. If you introduce a new food and she gets gas or loose bowels, the new food is the culprit and should be left out of her diet. Sores that are oozing can be caused by flea bites. Your pet chews at the itchy spot. Put some antibiotic ointment or listerine on the spot to clear it up. For digestive upsets with vomiting and diarrhea, your poodle needs some TLC and home cooking. Don't feed her for a while after the vomiting has stopped. Then start her off with a cooked piece of chicken with some cooked rice. Be sure she drinks lots of water to help rehydrate her. To take your dog's temperature use a rectal thermometer. Your vet can show you how to do it. Your pet's normal temperature is between 100 and 102 degrees. Take his pulse on the femoral artery on his upper rear leg. Normal pulse rate is between 80 and 140 beats per minute. Ask your vet to show you how to do this. Recognizing signs of poodle health issues and common illnesses and learning how to do temperature and heart rate checks at home on your poodle can help you keep up to date on your poodle health issues, and correct issues before they become serious.